The megapixel race has been going on for a long time, at least by the standards of mobile technology. It's gotten to the point that even the act of pointing out its ridiculousness is so old-hat as to seem archaeological. Still, on it goes, having reached a new height in the form of the Samsung Galaxy NX, which is ... well, I was going to say "essentially," but there's really no need even for that much equivocation -- it's a full-on enthusiast-grade camera that runs Android 4.2 and has 3G/4G connectivity. I don't believe it has traditional phone service, which is a real shame, because I would desperately love to see people trying to have conversations with it pressed up against their ears. 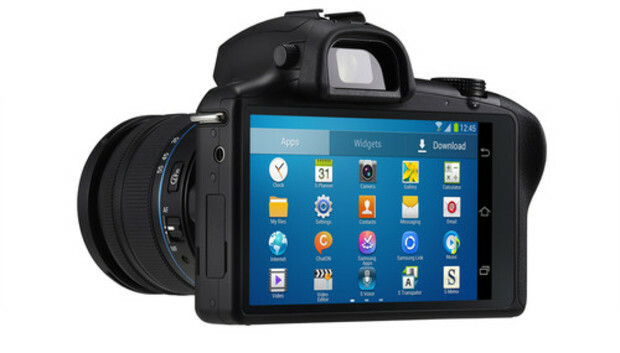 It does, however, boast a 1.6GHz quad-core CPU, 4.8-inch screen with 800x600 resolution, and a whopping 20 megapixels of digital imaging puissance, along with all the bells and whistles associated with nice digital cameras these days. The NX seems like kind of a white elephant on the surface, but if you think about it, it was almost an inevitability -- major Android OEMs seem to be running a little low on ideas lately, and the most-trumpeted new features for recent releases have tended to involve photography. So instead of gussied-up slideshows or fancy-pants panorama mode, Samsung avoided the beginner stuff and went straight after serious photogs. There's a reprehensible little subset of the single male population that subscribes to the belief that it's a fine and great thing to determinedly undermine a woman's self-esteem in the hopes of winning her favor. ("Pickup artists" is what they call themselves.) The technique is called "negging." On a corporate scale, it's kind of similar to what Huawei is doing to Nokia this week. The Chinese company scoffed publicly at Nokia's embrace of Windows Phone and called it "weak" at a launch event for the Ascend P6, according to the Financial Times. Consumer business group chairman Richard Yu, at the same event, confirmed that Huawei "is considering these sorts of acquisitions." All joking about flirtation aside, it's an interesting possibility -- Nokia's an old hand in the feature phone market, and Huawei could be thinking that the company's institutional experience might come in handy as it works to grow its smartphone business. Of course, that's all purely speculative, but, as a guy that grew up with those little Nokia candy bar phones, I have to admit I'm curious to see what kind of Android handset they might come up with. I was a big fan of the Nexus 7 when I first got my hands on it at Google I/O 2012. While I didn't think it was the most singularly impressive tablet on the market, even at the time, it's price-to-performance ratio was tough to argue with. So it's kind of a shame that it sounds like there's something pretty wrong with the midsize tablet -- as the reports of sharply degraded performance continue to mount. Android and Me's Dustin Early writes of 10-second delays, missed touch input and assorted other horrors in a heartfelt essay. Interestingly, an anonymous forum poster on Apple Insider claims that it's a problem with a Samsung-built flash controller that causes read/write performance to crater so badly. Make of that what you will. Packing a bigger battery and faster processor than its well-regarded metal-and-glass cousin, the Butterfly S is set to go on sale in Taiwan next month. No U.S. availability is yet known.